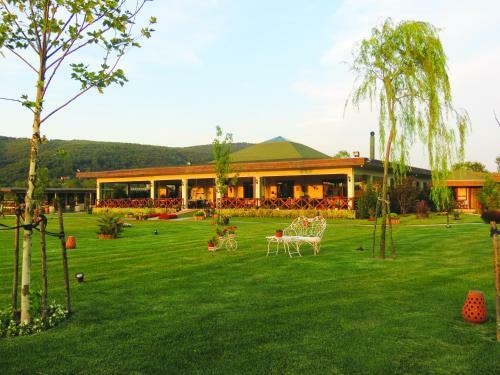 Village Park Country Resort is a four-star resort located in Istanbul, the city that is known as the heart of Turkey. Travellers who are looking for a perfect fusion of luxury, nature and peace are bound to have a pleasant stay. The resort features 32 furnished rooms, spa and wellness center, fitness center, indoor Jacuzzi pool, miniature golf and a variety of more deluxe amenities. Keep in mind that Village Park Country Resort is on the premium range. Given the lavish facilities and convenient location, it is ideal for vacationers on a luxury retreat. When it comes to enjoying your stay, rooms play the most important role! This is why we will first discuss the rooms at Village Park Country Resort. This resort has 32 rooms in total and they are divided into two categories - Village Rooms and Matsu Houses. Both categories offer room and laundry services, airport transfers, and access to free wireless and Ethernet Internet, cafe and swimming pool. All the rooms are strictly ‘no smoking’. Village Rooms are further divided into four types; Romance Rooms, River-Sera Rooms, Villas and Private Rooms. Each room comes with facilities such as central air conditioning, minibars, tea and coffee set, safety box, hair dryers, LCD TV, balconies, bath and work desk. Each room is spacious, airy and comfortably furnished. Village Rooms are geared toward solo travelers, couples, businessmen and families. There are three types of Matsu Houses, namely the Matsu, Bay Window Room with Jacuzzi and Log Cabin. Matsu Houses are amazing if you prefer privacy. They are smaller in size as compared to the Village Rooms, with a floor area of 35 sqm. However, most of the amenities are the same. To sum it up, the rooms have all the basic necessities you would need plus a number of luxurious amenities. To top it off, every room comes with a great outdoor view. Delicious food can make anyone happy! It is even better if the food is healthy. Village Park believes in natural and organic diet. The resort’s restaurant has a variety of cuisines, which include American, Italian and Turkish. The restaurant is rather huge with a capacity of 525 guests. The indoor can seat up to 175 guests while the outdoor space boosts greater capacity and ambience with its beautiful scenery. Built next to the panoramic Riva River, the garden restaurant can accommodate 350 people. During summer, the resort welcomes guests to have picnics under the trees or to lie on a hammock and dream away. Those of you who enjoy raw organic meals and fresh juices are in for a treat at Happy Life Café. It is a great place to detox for those who have been bingeing during their vacation. As the name suggests, the Pool Bar is right beside a swimming pool. Swim, relax and sip on your cool beverage! The Dingo Barn Bar is one of Turkey’s few Western bars. If you are a cowboy or a cowgirl, you will definitely enjoy hanging out in Dingo. Swimming - Village Park has a whooping 2000sqm pool area exclusively for adults. Don’t be sad, kids! There is a separate, albeit smaller pool, about 25 sqm in size for children. Other than that, there is a 60sqm pool beside the bar solely for hotel’s guests. All the swimming pools are encircled by greenery and shaded terraces with changing rooms around the corner. Endless pool - There is a ‘hidden’ endless pool at the Turkish resort. It is a fun-sized swimming machine that has the therapeutic benefits of a hot tub. You can perform low-impact water exercises, water yoga and floating meditation. It is awesome for travelers who want to stay fit during their vacation. River boat tours - During your stay at Village Park, you must take a Riva boating tour. Not only it is fun and exciting, the boating tour is a great way to explore the area. Swim in the coves of Black Sea, enjoy the scenic river panoramas and discover the point where the river meets the sea. Please contact the resort for further information on rates and packages. The Matsu Spa comprises a fitness center and spa facilities for rejuvenating spa treatments and health programme. The ‘Happy Life’ programme claims to make your life healthier by introducing a recommended diet. I cannot say for sure whether it truly works BUT if you are into super-foods and raw organic diet, you may consider giving it a try! Matsu is a Japanese word that means ‘pine tree’ in English. Matsu Spa is shrouded in seclusion, surrounded by evergreen plants, blooming flowers. If you are in need of a rejuvenating massage or a spa treatment, you won’t be disappointed at Matsu Spa. Even though it can get costly, the spa treatment is worth every penny! The resort organises various workshops and activities for adults and kids. For example, guests can participate in wall-climbing, Tai Chi, Latin dance classes, aerobics, yoga and mountain bike trips, etc. The staff can also arrange local tours upon requests. Village Park Country Resort is a fabulous accommodation if you do not mind splurging a bit. It has lavish amenities, amazing rooms and great customer service. The ambience is family-oriented, but at the same time, it provides privacy to couples and solo vacationers. Make sure to reserve the rooms in advance!